1 The video is pretty, what about the ACTUAL game though? 4 What consoles will it be available on? 5 What is the story based on? Avengers: Battle for Earth provides one of these questions with an answer, apparently Wii-U, Xbox 360/kinect. What throws me off at this stage is the fact that they state xbox 360/Kinnect, I hope it is not a Kinnect game, and instead has the option to use Kinnect. Kinnect could be a decent way to play games, if only the games thus far brought out were not as buggy and slow to react as they currently are (see the Star Wars dance game fiasco). Also, they show Spiderman, Wolverine, Venom, Magneto and Storm in the clip. Ok, so we know that it is the Marvel Universe and as such, we would see some other Marvel IP’s in the world/game, but are they playable? Will I be able to swing through the streets as Spiderman? Claw my way up buildings with Wolverine? Fry the crap out of bad guys with Storm? Throw cars at good guys with Magneto? I have no opinion on the game until I see what they ACTUALLY intend to do, but one thing is certain.....The video is pretty. 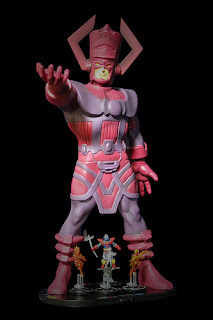 I would love to see Marvel use the Skylanders system to create a Marvel Universe variant using figures of even Super Hero Squad, it would be great to see them do this, it would stick to the kid theme and should move units. Market it just the same, you get a great painted figure of your fave characters AND the in game character to use. Also, you could have it like the Lego: Batman game, where you can play as either Hero or Villain. Also, a super smash brothers style game would be excellent, sure it would just be smash brothers, but with Marvel. I would buy it for sure. 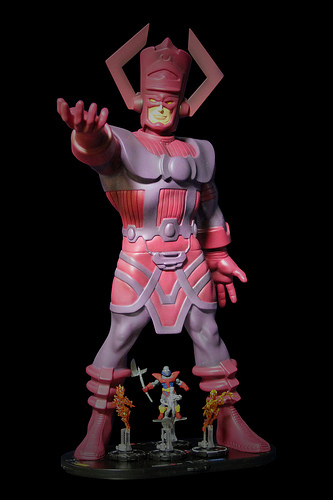 rger figures Galactus, Sentinel Prime and the like?